The marker is located north of Burkburnett in a small park-like area along I44, just off Exit 14, on SH 240, on the west side of 3rd Street. GPS coordinates: 34-degrees 06' 3.7" -98-degrees 32' 51.3". Named for the red soil across which it flows, the main stream of the Red River is 1,300 miles long, and for 440 miles the river forms the Texas-Oklahoma boundary. The 1819 Treaty with Spain established the course of the Red River to the 100th Meridian as part of the boundary between the States and New Spain. Until after the 1845 Annexation of Texas, the river did not lie entirely within the United States. During the Spanish Colonial Period, the waterway and the crossing here became a main gateway into Texas. In the mid-19th Century, brisk steamer traffic went on at the eastern end of the river. A military expedition under Capt. Randolph B. Marcy in 1852 explored the river to its upper reaches in land held by Native Americans. In 1921, the Burkburnett Oil Boom here led to a dispute between Texas and Oklahoma over ownership of the valuable river bed. The Supreme Court in 1921 and 1923 upheld the south bank as the Texas border. This site is 25 miles west of the important Old Fort Sill Crossing on the major military road that once linked the Oklahoma fort to outposts on the Texas frontier. The bridge here, opened to traffic in 1927, is the second free bridge to span the Red River. On the obverse of the sign is engraved, "Marker erected by Wichita County, G. Clark Gresham, Commissioner Prect. 2." 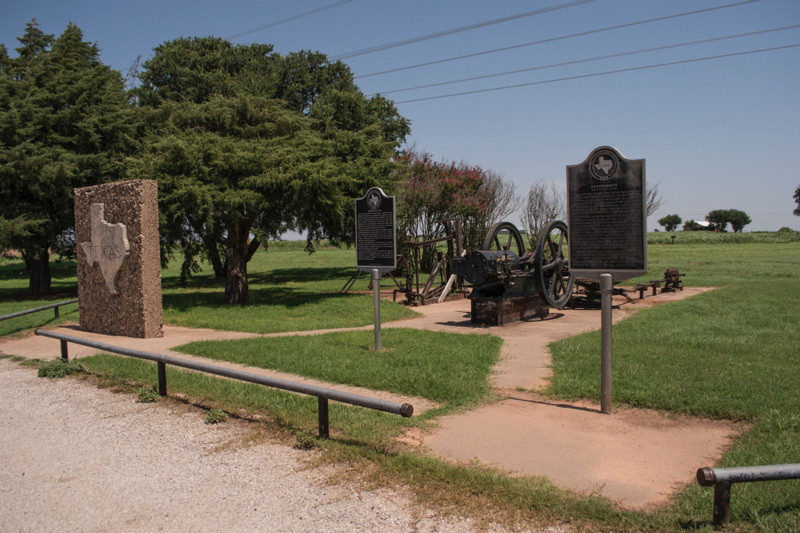 Park-like area where the markers for the Red River (left) and the City of Burkburnett stand. Behind them, an oil field power house, relevant to the history of the oil industry, is on exhibit.